This is the #BakingWithBetty recipe that scared me the most! I was so excited to finally get into the Betty Crocker kitchens and start baking. We had to wait until the second day so once breakfast was over I was ready to get started and see what we got to make (and eat). As we walked up to the first kitchen station I saw the crepes and just knew. I had never made crepes. I had never wanted to make crepes. They are one of those things that I eat at a restaurant so that I do not have to go to all the trouble of making them. I went into it planning on it being horrible. I figured that they would be really hard to make and I would hate it. They ended up being very easy. Once I got started I just could not stop. There are two things about this recipe that I was surprised about. I could not believe that you could make really good crepes with bisquick! I also wondered how the filling made with pudding would taste. The recipe turned out to be super easy, beautiful, and very tasty! In small bowl, beat Bisquick mix, sugar, 1/2 cup milk, the melted butter and eggs with whisk or fork until blended. Grease 6- or 7-inch nonstick skillet with shortening; heat over medium heat until bubbly. Use a small measuring cup to pour a very thin layer of batter into skillet; immediately rotate skillet until batter covers bottom. Cook until golden brown on bottom side. Run wide spatula around edge to loosen; turn and cook other side until golden brown. Stack crepes as you remove them from skillet, placing waxed paper between each; keep covered. In small bowl, beat sour cream, 1/2 cup milk, the lemon peel, lemon juice and pudding mix with whisk or fork until blended. 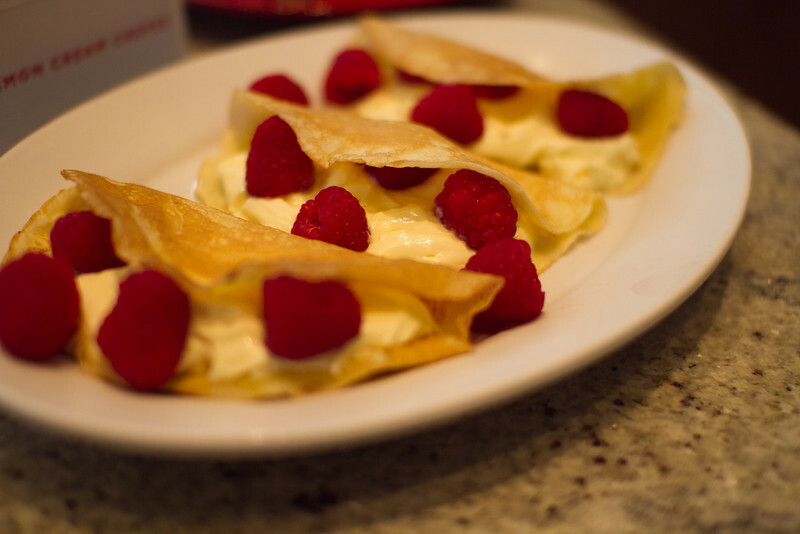 To assemble each crepe, spoon about 1/4 cup of the filling on one end of crepe; top with 5 raspberries. Roll up; sprinkle each crepe with powdered sugar. Serve with additional raspberries. Make sure to also check out more about our Baking With Betty trip and enter our Pillsbury Sweet Moments Giveaway. Some of the photos from this trip were professionally taken for us by Matt Holland. Thanks Matt! General Mills paid for my trip. They did not ask me to blog about my trip or give any recipes. It was my choice to do so. I love crepes but have never tried making them. This really sounds simple. Thank you for the recipe.